We’d love your help. Let us know what’s wrong with this preview of The House of Binding Thorns by Aliette de Bodard. As the city rebuilds from the onslaught of sorcery that nearly destroyed it, the great Houses of Paris, ruled by Fallen angels, still contest one another for control over the capital. House Silverspires was once the most powerful, but just as it sought to rise again, an ancient evil brought it low. Phillippe, an immortal who escaped the carnage, has a singular goal—to resurrect someone he lost. But the cost of such magic might be more than he can bear. To ask other readers questions about The House of Binding Thorns, please sign up. Ultimately, my second foray into the Dominion of the Fallen did not turn out the way I’d hoped, though to be fair, I did have a lot riding on this sequel. It’s true that the first book left me with mixed feelings, but I found the premise intriguing enough that I wanted to see where things would lead, and maybe give this series a another chance to sweep me off my feet. Regrettably, this did not quite happen—despite The House of Binding Thorns being a pretty decent follow-up. At the end of the day though, I simply found myself tripping over a lot of same hurdles as book one. First of all, in spite of the suggestions that this can be read as a standalone, I would highly recommend against it. Definitely read The House of Shattered Wings first if you can; you will find the background information absolutely indispensable, especially in anchoring you to the setting. In the aftermath of the war between angels, the proud city of Paris is now only a ghost of what it once was, and the Fallen are now divided in several houses all vying for power among the crumbling ruins. Most of the characters here were originally introduced in the first book, including Madeleine, an alchemist suffering from an addiction to angel essence. Upon her return to House Hawthorn, their leader Asmodeus mercilessly purges that addiction from her, with the intention of sending her on a diplomatic mission to the dragon kingdom under the Seine. Meanwhile, Philippe is also back, now mourning the loss of Isabelle, the fallen angel with whom he had shared a mental link. While searching for a way to resurrect her, he comes across Berith, another Fallen who claims to be Asmodeus’ sister. The exiled angel is currently keeping a low profile, hiding herself and her pregnant human lover Françoise from the chaos and poison of the clashing Houses. However, due to their familial connections, Berith may not be as well hidden from Asmodeus as she has led Françoise to believe, and in the escalating conflict between all the factions involved, it is becoming increasingly clear that no one will be safe from the violence. Right away, I was struck by how little I remembered from the first book. I had to go back to my review of The House of Shattered Wings to remind myself who was who, and in doing so, I also noticed what I had written about the characters and how I’d struggled to engage with any of them. Unfortunately, this is a problem that persists; there are too many characters and not enough personality between them to justify so many, and the result is just a jumble of names and descriptions that I tried to but could not connect with on a deeper, emotional level. For this simple reason alone, the rest of the book fell apart for me, even though I admit from a technical standpoint, The House of Binding Thorns is probably a better book than its predecessor. However, I need to care about the characters to care about the story; without that foundation, it’s hard to get on board with everything else. Furthermore, though I was impressed with the allegorical themes of post-colonialism, I’m not sure they came through well enough amidst all the noise. Paradoxically, the plot felt simultaneously too complicated and too superficial, overly simplistic. At times, The House of Binding Thorns felt very much like a “middle book”, in the sense that it is neither here nor there, striving to expand the story and characters beyond the first novel but ultimately falling short of achieving the desired result. Again, all the ingredients seem to be there—the history, mythology, philosophical discourse and world-building, etc.—and in many cases they even surpass their scope from the first book, but for the reasons I touched upon above, the story simply failed to “speak” to me. Not leaving a rating because this is my book, but here's what you can expect: focused on the House of Hawthorn and the dragon kingdom. Like its predecessor, standalone, though characters from the first book will obviously be around! Major characters: angel essence addict Madeleine, Houseless Annamite Françoise (who wields rather peculiar and powerful Fallen magic), dragon prince Thuan (with a talent for getting into major trouble), and ex-Immortal/exile Philippe on his quest to resurrect his frie Not leaving a rating because this is my book, but here's what you can expect: focused on the House of Hawthorn and the dragon kingdom. Like its predecessor, standalone, though characters from the first book will obviously be around! Major characters: angel essence addict Madeleine, Houseless Annamite Françoise (who wields rather peculiar and powerful Fallen magic), dragon prince Thuan (with a talent for getting into major trouble), and ex-Immortal/exile Philippe on his quest to resurrect his friend. And hum, yes, rather a lot of Asmodeus (head of House Hawthorn), too, for obvious reasons. And more ruined and decayed and dangerous Paris, and political intrigue, and backstabbing. The House of Binding Thorns is the best fantasy I've read so far this year, the opposite of second book syndrome, and part of a series you need to read if you're interested in diverse SFF. I really liked The House of Shattered Wings, but this was on a completely other level - the character arcs actually went somewhere, the conspiracy was unpredictable but didn't come out of nowhere, and there were even more queer characters. 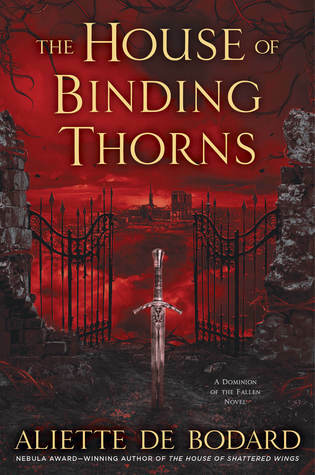 If The House of Shattered Wings followed the events surrounding the myste The House of Binding Thorns is the best fantasy I've read so far this year, the opposite of second book syndrome, and part of a series you need to read if you're interested in diverse SFF. If The House of Shattered Wings followed the events surrounding the mysteries and past of House Silverspires, this book follows another house of fallen angels in fallen historical Paris: House Hawthorn, and its relation with the underwater Dragon Kingdom in the Seine. ✨ not PoV characters, but a major characters anyway: Asmodeus, gay fallen angel, antivillain, in an arranged marriage with a prince from the Dragon Kingdom, and Ngoc Bich, a dragon princess. I loved them both, Asmodeus because he's awful and Ngoc Bich because she's awesome and just a bit awful. In the first book, not being able to connect with the characters was one of my main problems. Here, that didn't happen - I loved all of the new ones (Thuan's and Françoise's PoVs were my favorites), but Madeleine grew on me a lot, and some of the side characters were just as memorable as the PoV ones. I read this book in two days, which is something I haven't been able to do with novels - especially not with adult fantasy - lately. But this was so good that I just couldn't stop reading it. So much political intrigue, most of it revolving around a gay antivillain, of course I loved this. I also really liked the setting - in The House of Shattered Wings, I wanted to know more about the Dragon Kingdom, and a significant part of this book is set there. This also meant that this book gave an even more overwhelming sense of rot than the first book, and it may sound weird, but the atmosphere is beautiful also because of it. Ruins have their charm, and it makes sense that in a series about falling the settings is falling apart too. The House of Binding Thorns is the second installment in author Aliette de Bodard's Dominion of the Fallen series. In a Paris that never was, a city of magicians, alchemists and Fallen angels struggles to recover from a devastating magical war that left the city in shambles. The House of Hawthorn, led by a Fallen Angel named Asmodeus, is where this story begins. But, it also includes the Dragon Kingdom, which is an under the Seine River, that gets plenty of storyline as well. A magnificent follow up to House of Shattered Wings, with everything I loved about the first book (fallen angels, House drama, Paris, dragons(!)) amped up to 11. Will absolutely re-read, which is one my favorite ways to praise a wonderful book. Any book that has me struggling not to squeak on public transport and then has me nearly miss my bus stop is going to get a big thumbs-up. I loved Aliette de Bodard’s introduction to her vision of a blasted, magic-torn Paris in The House of Shattered Wings and I delighted in the chance to return to it and peer into one of the darker Fallen Houses. Madeleine is back in House Hawthorn, terrified of her future and unable to move on from her past. When Asmodeus makes it clear she can choose to die bu Any book that has me struggling not to squeak on public transport and then has me nearly miss my bus stop is going to get a big thumbs-up. I loved Aliette de Bodard’s introduction to her vision of a blasted, magic-torn Paris in The House of Shattered Wings and I delighted in the chance to return to it and peer into one of the darker Fallen Houses. Madeleine is back in House Hawthorn, terrified of her future and unable to move on from her past. When Asmodeus makes it clear she can choose to die but not the manner of her dying, her fear drives her to once again swear allegiance. But can she be a faithful servant of House Hawthorn? Philippe is living in the Annamite community, surreptitiously using his magic to heal and trying to avoid attention while he tries to find a way to resurrect Isabelle. Asmodeus himself is seeking alliance with the dragon kingdom beneath the Seine, but the rong have their own issues: a rebellion and an insidious plague of addiction to angel essence. When his envoy disappears, he sends another - and Madeleine - to seal the deal. We also meet new characters, get to know old enemies better and uncover unexpected secrets. I found this a gripping read from start to finish, just about approachable as a stand alone but all the richer if you have the context of House of Shattered Wings. The dragon kingdom and House Hawthorn are fascinating contrasts to Silverspires. I look forward to whatever the future may hold for poor, battered Paris and her inhabitants. Quick & Dirty: A powerful conspiracy aimed not only at the houses but the dragon kingdom threatens to destroy them all. Opening Sentence: In the House of Hawthorn all the days blurred and merged into one another, like teardrops sliding down a pane of glass. Madeline has finally been detoxed from the angel essence, but no one is really sure she will survive since no one has successfully broken and essence addiction before. However, when Asmodeus gives her the choice of death or loyalty (in which she will never do essence again), she chooses loyalty and soon is given a task to accompany Elphon and others into the dragon kingdom to secure a marriage for Asmodeus. Once there, Madeline finds that the real reason they are there is because the Ambassador is missing and Asmodeus cannot find her. Soon they find out she left the palace three days before and hasn’t returned, Elphon takes off and Madeline has to come clean that he has left but that he should return later. However, once she finds a cryptic message from the missing Ambassador telling her to meet with the Prince, Madeline knows there is more going on and something is very wrong. Meanwhile, Thuan is spying in the House of Hawthorn and he is determined to find proof that they are the ones bringing the angel essence into the dragon kingdom. Philippe, the doctor, has found a woman having a child with Asmodeus, and begins negotiations to bring them in the House of Hawthorn. Madeline meets with the Prince and soon after is taken captive by Yen Oanh. Soon she finds herself faced with the awful choice of being killed or using angel essence in order to escape. As everything begins to unravel, Madeline, Asmodeus and Thaun will all be faced with impossible choices and House of Hawthorn will either fall or rise from the ashes. I highly recommend you read book one before reading this one. You will be lost, it took me awhile a to remember everything because I read book 1 a few months ago and have read so many books in between now and then. I am not a big angel fan, I have found much like steampunk it is very hit or miss with me. Usually miss, but this series is intriguing and beautifully written. There is a lot going on in the first two books. I still don’t feel a big connection with the characters, but I will say I didn’t see how or what was behind the conspiracy until it was revealed to me. This is a subtle and layered book, and most of the action doesn’t really pick up until about midway through the book. I found myself devouring the pages, but still trying to put everything together. I am not sure where the author is going with the series, but count me in for the ride. Iaris didn’t understand. She couldn’t understand. She hadn’t stood in the drawing room watching Frederic, and Zoe and Elphon and all the other gardeners be cut down. She wasn’t the one who had crawled through the streets of Paris, the cobblestones slick with her own blood, every movement awakening fresh pain in her calves, in her broken ribs, every agonizing guesture underlined with the same fear that he would find her, that his thugs would finish what they had started. This was a marked improvement over its predecessor, The House of Shattered Wings. Shattered Wings had a somewhat confusing plot, and only a handful of its characters really interested me, but it had such a great setting that it elevated it to 4/5 stars. Not that the characters and plot were BAD, they just didn't really grab me. The House of Binding Thorns improves on both, and the setting managed to be even better. So Binding Thorns is a semi-standalone sequel. It follows after the events of Shat This was a marked improvement over its predecessor, The House of Shattered Wings. Shattered Wings had a somewhat confusing plot, and only a handful of its characters really interested me, but it had such a great setting that it elevated it to 4/5 stars. Not that the characters and plot were BAD, they just didn't really grab me. The House of Binding Thorns improves on both, and the setting managed to be even better. So Binding Thorns is a semi-standalone sequel. It follows after the events of Shattered Wings, and retains a few of the principals as main characters, but it is a wholly new story that doesn't rely on its predecessor at all. Following the events of Shattered Wings, House Hawthorn and Asmodeus are ascendant, and this book is centered on Asmodeus' attempts to form an alliance with the Dragon Kingdom beneath the Seine. So how is it an improvement? Well, the principal characters all interested me way more in this book. Holdovers include Philippe, the exiled immortal, now acting as a doctor in the Annamite slums of Paris (Annam being an archaic French term for Vietnam), and full of regret for what happened in the previous book, and Madeleine, the Angel Essence-addicted alchemist, cast out of Silverspires and back in service of Hawthorn and Asmodeus. Joining the principal cast are Francoise, the pregnant lover of a Houseless Fallen, and Thuan, a member of the ruling family of the dragons and spying on House Hawthorn as an ordinary Annamite. So how is the setting even better? Because we spend a lot more time in the Dragon Kingdom, basically. De Bodard's alterna-Paris is great, but I'm always interested in books drawing from cultures I'm unfamiliar with (and my knowledge of Vietnamese culture can be summed up with "pho is delicious"). The Dragon Kingdom is based on Vietnamese mythology about dragons as water spirits, and it's all just really interesting and unlike anything else I've ever read before. I have two chief critiques of this book. One, I had trouble keeping the dragons sorted in my head, but I think that was more my trouble with Vietnamese names all sounding alike to my American ears. The other is that the plot, though clearer than in Shattered Wings, was still somewhat confusing, with a number of developments that seemed to come out of nowhere. Bodard writes with an intricate and intense style and is able to explore the way conflicts both within the heart and those of external politics collide with and influence each other. Vivid and emotional. Recommended. ...I generally enjoy De Bodard's work, both stylistically and because of the themes she uses, and this novel is no exception. I thought the plot of this novel flowed a bit more smoothly than that of the House of Shattered Wings. It is dark and desperate, full of characters overreaching in an effort to prevent what little they have managed to salvage from destruction slipping from their grasp. It tackles some of the problems of today's society with a touch of Victor Hugo and a bit of magic. It bl ...I generally enjoy De Bodard's work, both stylistically and because of the themes she uses, and this novel is no exception. I thought the plot of this novel flowed a bit more smoothly than that of the House of Shattered Wings. It is dark and desperate, full of characters overreaching in an effort to prevent what little they have managed to salvage from destruction slipping from their grasp. It tackles some of the problems of today's society with a touch of Victor Hugo and a bit of magic. It blends the Christian power of sacrifice and redemption with the eastern flow of life force and sense of duty. It is a novel that has a lot to offer. One of those books that will yield more on a reread. The House of Binding Thorns was high on the to read list for this year and fully lived up to my expectations. Not many books manage to do that. The House of Shattered Wings is a beautifully written book set in a fascinating world, but I was on the fence about reading the standalone sequel since it was also bogged down by so much narrative introspection that didn't add much to the story or characterization. However, I decided to continue after discovering The House of Binding Thorns had more Asmodeus--and I'm so glad I did because it's a far superior novel with more Asmodeus and more of the dragon kingdom! Like its predecessor, the charac The House of Shattered Wings is a beautifully written book set in a fascinating world, but I was on the fence about reading the standalone sequel since it was also bogged down by so much narrative introspection that didn't add much to the story or characterization. However, I decided to continue after discovering The House of Binding Thorns had more Asmodeus--and I'm so glad I did because it's a far superior novel with more Asmodeus and more of the dragon kingdom! Like its predecessor, the characters aren't quite as "alive" or in possession of distinct personalities/narrations as I would have liked, but I though they were more compelling than in the previous novel. It's gorgeously written and atmospheric, and it's a standout novel with some unique qualities that I enjoyed very much. HOUSE OF BINDING THORNS was every I wanted it to be, and even more. What a perfect choice for my first foray into audiobooks. Political fantasy is always my jam, and this being in Paris is icing on the already delicious cake. Madeleine and Philippe were my two favourite characters from the first book, so you can imagine just how thrilled I was to find them here. And Asmodeus. Oh, the level of burning hatred I had for him during most of the first only equals the level of absolute love I have now. HOUSE OF BINDING THORNS was every I wanted it to be, and even more. What a perfect choice for my first foray into audiobooks. Political fantasy is always my jam, and this being in Paris is icing on the already delicious cake. Madeleine and Philippe were my two favourite characters from the first book, so you can imagine just how thrilled I was to find them here. And Asmodeus. Oh, the level of burning hatred I had for him during most of the first only equals the level of absolute love I have now. Let's be real, he is 100% Claudie bait, and I jumped into that dumpster with incredible love. I also already loved Thuan from "Children of Thorns, Children of Water" and I am so 100% here for the way his storyline went. This book was amazing in context and plot line. I love the way it lets you know how everyone fits in without giving too much away so that you can predict the ending. I would not use as a tutorial for my younger kids that I tutor but would recommend for 8th grade to adults. This is mostly because of the complexity of the writing. There is no vulgarity which makes it a good read for higher level school kids. I struggled a lot with this one and I feel that's due to two main things: one was a reading slump the likes of which I've never really experienced (I don't think I've ever really felt this much of a slump, to the point of near indifference); the other was the fact that for the vast majority of the book, the main POV character is Madeleine and hers was the perspective that really dragged down my overall enjoyment of The House of Shattered Wings , so I would be lying if I didn't say that I very nearly gave up on the book when I saw that. However, let it not be said that I'm completely heartless or a quitter (after all, I so rarely give up on anything when it comes to books) and by the last 25%, I really was enjoying myself quite a bit more. De Bodard manages to tie in everything in a very unexpected climax and actually, I would again be lying if I didn't admit that my interest in any further books in this setting has most definitely been piqued. As the title suggests, The House of Binding Thorns is all about Hawthorn. After the events of the last book, loyalties are being tested and characters trying to rebuild from the ashes find themselves being asked to pay too great a price for their hearts desires. There is scant mention of Silverspires here and actually I quite enjoyed the attention shifting away from them. If there is any intention of a third book, then de Bodard clearly will be able to choose from quite the array, be it Lazarus (the House ruled by a human rather than a Fallen) or the new one introduced in this book, a newcomer to the world of intrigue, politics and death that is Paris after the magical war. There is also a larger focus on (view spoiler)[the dragon kingdom (hide spoiler)], something I definitely enjoyed. I liked the descriptions of the palaces and its inhabitants, I liked the links between it and the world of south east Asia (most notably Vietnam), I liked that de Bodard made them all very fierce contenders with the power and magic and influence of the Fallen-ruled Houses. In that respect, it's a very interesting clash of cultures, one I really enjoyed reading about. There are a lot of nuances here, about being an immigrant and hiding from the dominant culture, about the lives of the Houseless (also mostly Vietnamese immigrants) and the squalor of living in what amounts to slums, while those who do have have a House find that, if nothing else, they at least have protection and a hot meal, both things that de Bodard immediately paints as being vital to survival in Paris. There are new characters introduced in this book, alongside old faces and again, bar Madeleine, I did like them. There's Philippe again, living with the weight and the guilt of the choices he made at the end of the last book and though he plays a far less prominent role in this than in the first book. There are new characters from the (view spoiler)[dragon kingdom (hide spoiler)] and I liked the exploration of the differences between their magic and that of the Fallen, something that is exemplified masterfully in the ending of the book. A part of me feels that the setup is very much towards these two worlds working together to rebuild Paris, to show cooperation and to heal the wounds that the power struggle left wide open. It's also interesting to see de Bodard tackle relationships (both platonic and romantic) between humans and Fallen -- where this is mostly just touched upon in the first book with Philippe and Isabelle (and his nature isn't one I would strictly call human), the existence of Berith and Françoise is one that leaves a lot of questions unanswered. We know from the first book that humans can wield Fallen magic through angel essence (and its addiction and side effects are still a key point in this sequel), but what about long-term exposure? Both Selene's and Asmodeus' lovers are Fallen, but could they (would they) fall in love with a human? I also liked the fact that this human/Fallen affair is tackled through the eyes of lesbians, with all the prejudices that come of it. Françoise's struggles with the Annamite community I found to be incredibly interesting (and heart-rending), in a way that I don't see a lot of fantasy explore. I really hope that any sequels that may or may not happen do still follow her, even if she isn't as much of a central character. So, this book is best understood after you have read the "Further Reading" notes at the end. Y'see, this is an allegory on the early history of French interference in Vietnam, merged with the story of the British running opium into China, but set in Paris (sort of) with dragons and magic. "Not gonna work," you think, and I fear you are right. First off, some Parisian places are named, but for all that they are tied to the story we might as well have been in Barsoom or Lyonesse. Second, there are So, this book is best understood after you have read the "Further Reading" notes at the end. Second, there are way too many characters, and far too much use of redshirts, the guards and peasants who are in the book only to be slaughtered by the lead characters. At times, it's a tribute to Zola (mentioned in the author's notes.) Other times it's almost like the sketch for a graphic novel or a CGI movie. Halfway through, I shouted that if Olympe called someone "Child" once more I was going to throw the book across the room and never pick it up again. Oddly, just at that point the author stopped doing it. And the notes suggest that the "child" thing may have to do with Vietnamese pronouns. A quick Wikipedia told me I'm not going down THAT rabbit hole in the foreseeable future. So, we follow Madeleine a lot. She's a classic viewpoint character, going "der" a lot and shuffling from key scene to key scene without ever really surfacing. But there's a reason for it, and in the end she matters, so it's all good. Berith and Francoise were OK, I guess, as peripheral people just trying to get by. Still not sure about Thuan and Philippe, both of whom seem to carry some pretty heavy magic chops but are in a fog most of the time. Speaking of fog, the whole dragons-under-the-Seine was a giant WTF in which apparently you and I can, if invited, just walk into the river and carry on as if we were not underwater. Felt all cartoony to me, because if it isn't there's some magic power here that is way beyond what the key characters carry. In the end, it's an interesting rollout of a few people who perhaps appear conscienceless but do have something they are loyal to in a very difficult world. This is, of course, displayed by forcing them to deal with characters who may not have such well-developed moral compasses. I'm not really looking forward to a third book in this series, but I will look for more work by this author. I'll be looking for a little less emphasis on lesser-known historical and cultural details. Terry Pratchett struck a nice balance in some of his fantasy books that are loosely based on history, such as Night Watch or Monstrous Regiment. Just like with the first book, I have mixed feelings about this one. On the one hand, this is a fascinating, unique world with cutthroat politics and diverse people groups, and that's fun to read. On the other hand, I still can't bring myself to care about the characters, which seriously dampens the thrill factor. I wanted to like this much more than I actually did. Maintenant je me demande 4.5 en réalité! C'est mal de l'aimer autant mais rhaaaaaa, Asmodeus... toujours aussi fascinant, et on le voit beaucoup dans ce tome. De nouveaux personnages qui apparaissent (coeur coeur coeur sur Thuan), des anciens qu'on suit toujours (Philippe et Madeleine)... complexe, mais passionnant, je le relirai aussi à la sortie fr pour être sûre de n'avoir rien zappé. Et vivement la suite ! I know that I've fallen for a fantasy series when I find myself ensnared by the second book. A dark slow burning urban fantasy feat. queer fallen angels and a queer Vietnamese dragon prince with magic and rival houses in post-apocalyptic Paris. Thuan is my new favourite dragon prince and character, so I need the next book asap. I read this because, well, I read the first book in this series and I loved it. I was especially drawn by the promise of focusing on Madeleine, one of the protagonists of the first book, who I found particularly intriguing. Now, looking back at it... It's strange, but I'm having a hard time figuring out what to say about it. It was good, obviously. I tore through it in a single night and cheerfully paid the price of the lack of sleep that engendered. Still... I can't think of anything coherent to I read this because, well, I read the first book in this series and I loved it. I was especially drawn by the promise of focusing on Madeleine, one of the protagonists of the first book, who I found particularly intriguing. Now, looking back at it... It's strange, but I'm having a hard time figuring out what to say about it. It was good, obviously. I tore through it in a single night and cheerfully paid the price of the lack of sleep that engendered. Still... I can't think of anything coherent to say afterwards. So here are a few bullet points. Lots of awesome returning characters! I will admit that I was deeply fascinated by the increasing depth given to Asmodeus. As a character, he's definitely modeled in a certain mode that I associate strongly with a certain flavor of anime villain, for some reason. And de Bodard does an amazing job with that archetype. She doesn't stint on his cruelties and flaws, but also doesn't stint on his loyalties and generosity. He is vicious and cruel but he's not capricious -- and that makes him utterly fascinating. Thuan's really exciting as a new character. I loved his introduction, the way he navigates the world, his bad romance with Asmodeus. At the end of the novel he made an impetuous, idealistic decision... And I want to see how it turns out. Oh, Madeleine. I'm glad that she finally managed to have a breakthrough and move on. And yet the realization that allows her to do so is strangely heartbreaking, the idea that the best she can do to move forward is to believe that Asmodeus won't hurt her without a reason. In a way it's capitulation to the predation of the Houses: she hasn't escaped in any way, she's just found a way to live with her situation. Overall, great plot momentum. Started off wondering how all the bits would fit together and then watched in amazement as it was all woven together in a smashing conclusion. Masterful stuff. How do you even plan that kind of thing? my entire reaction to this book at this point is :|||||| ... it took me ages to finish bc I was continually confused at how the pacing usually overthrew the plot (two people talking to each other: it can happen without 75% internal dialogue) and I didn't understand the plot until the very end. anyone who's read house of shattered wings and wants to read this should know a) it's a STANDALONE SEQUEL, which I did not understand and b) paraphrased from her own notes at the end, the relations b/t the my entire reaction to this book at this point is :|||||| ... it took me ages to finish bc I was continually confused at how the pacing usually overthrew the plot (two people talking to each other: it can happen without 75% internal dialogue) and I didn't understand the plot until the very end. anyone who's read house of shattered wings and wants to read this should know a) it's a STANDALONE SEQUEL, which I did not understand and b) paraphrased from her own notes at the end, the relations b/t the dragon kingdom and the Houses are based on the early history of French interference into Viet affairs in the 19th century and on the British opium traffic into the Chinese empire that led to the Opium Wars. I AM slow on the uptake for these kind of things, but this info is extremely helpful when wading thru the plot(s) of this book. I know this review is terribly late; I salved my conscience by buying a copy as well. Aliette de Bodard has built a fascinating world in this post-apocalyptic Paris, and it’s so refreshing to get Vietnamese influences running through a story like this — it might be set in France and involve angels of a rather Western bent, but it also features dragons of a rather more Eastern variety. I don’t think you can really read this without The House of Shattered Wings; you need the background for Madeleine and Philippe. I was surprised, though, at how interesting I found Asmodeus. I wasn’t too taken with him before, but this book does show another side to him. There’s also a lesbian couple, Françoise and Berith, and their story is new here, but adds more to the world. If The House of Shattered Wings didn’t work for you, I suspect that The House of Binding Thorns won’t, either. I found it bleakly beautiful, and really enjoyed the additions to the world-building and the way the characters grew and changed, or at least revealed other aspects of themselves. It also won’t work for you if you’re not a fan of something that falls squarely into moral grey areas: you could have believed Silverspires were the good guys, in the previous book, but now the house is Asmodeus’, and for all that you kind of find yourself rooting for him, he’s still not a pleasant person. A lot going on at times but I really liked this book. Asmodeus is the man you love and hate at the same time. I really loved the strength of Madeleine. She was a real heroine in the end. Philippe came through for his people and Isabelle. With Thuan sharing responsibility with Asmodeus for the house things may really be different in a good way for House Hawthorn. Still the same technical issues as the first installment (my god, please stop using the word "predator"), but overall far more enjoyable. Probably because I knew what to expect? Hint: it's a story about postcolonialism told through a fantasy lens, and relying almost exclusively on an atmosphere of superb decay to make its point. Rovnako ako Řád zlomených křídel, aj druhé pokračovanie tejto série je písané veľmi lyrickým a náročným štýlom. Jednotlivé kapitoly sú plné nádherne a podrobne opísaných zbytočností, ktoré som však ako zbytočnosti nevnímala, nakoľko ma vďaka nim doslova pohltila atmosféra poničeného Paríža, v ktorom čoskoro neostane jediná celistvá tehla. Ako napovedá samotná anotácia, toto pokračovanie je voľné, takže nie je presne jasné, aký časový úsek ubehol od udalostí na konci jednotky. Ale v podstate to an Rovnako ako Řád zlomených křídel, aj druhé pokračovanie tejto série je písané veľmi lyrickým a náročným štýlom. Jednotlivé kapitoly sú plné nádherne a podrobne opísaných zbytočností, ktoré som však ako zbytočnosti nevnímala, nakoľko ma vďaka nim doslova pohltila atmosféra poničeného Paríža, v ktorom čoskoro neostane jediná celistvá tehla. Ako napovedá samotná anotácia, toto pokračovanie je voľné, takže nie je presne jasné, aký časový úsek ubehol od udalostí na konci jednotky. Ale v podstate to ani nie je dôležité. Pretože v tejto knihe sa rozohráva úplne nezávislý a takmer samostatný príbeh, v ktorom akoby mimochodom vystupovali už známe postavy. Táto vedomosť mi to však nijako nezjednodušila čítanie, nakoľko ich charaktery sú rovnako zložité ako som si pamätala, čím sa čítanie premieňalo na zaujímavú detektívnu prácu. Totiž, ja som si nikdy nebola istá tým, čo ktorá postava urobí alebo povie, nakoľko ich správanie nebolo pevne zakotvené v ich vlastnostiach. Čím nechcem povedať, že postavy boli zle napísané, to ani v najmenšom. Boli to úžasne fascinujúce osobnosti s naozaj komplexnými vlastnosťami, pri ktorých nikdy nebolo nič len biele a len čierne. Navyše boli mnohé z týchto postáv aj rozprávačmi jednotlivých udalostí, čo dej takisto ozvláštňovalo. Prostredie sa trochu zmenilo, videla som aj zničený prístav a štvrte obývané ľuďmi, ktoré nepatria k žiadnemu rádu. Musia sa pretĺkať a ich dni sú naozaj žalostné, vďaka čomu niektoré časti príbehu získali zvláštnu depresívnu líniu. Akoby nestačil zničený romantický Paríž, v ktorom už nestojí ani Notre-Dame. Zdevastované a vojnou schátrané mesto vo svojich útrobách privítalo ľudí z rôznych pomerov. To, čo knihu najviac ozvláštňuje, je však kombinácia takmer až klasického európskeho prostredia, v ktorom sa predstavuje exotický vietnamský folklór. Východná kultúra je nám nesmierne vzdialená a som rada, že Aliette využila aj svoj zmiešaný pôvod. Vďaka tomu mi bola predstavená mytológia na hony vzdialená Grécku či Slovanom a mágia, v ktorej je dôležité čchi, dračie príšery a uctievanie predkov. Oproti predchádzajúcej knihe som túto časť príbehu mohla lepšie preskúmať, čo ozvláštňovalo knihu a nútilo ma to myslieť si, že čítam niečo absolútne nové a originálne. Čo je pravda len čiastočne. Totiž, došlo k zmene kulís, ale nie k zmene scenáru. Aj tentoraz som teda mala možnosť pozrieť sa hlboko do klbka nekonečných intríg a mocenských hier. Kvôli tomu je plynutie deja skutočne pomalé, rozvážne a únavné. Čo ma len utvrdzuje v presvedčení, že táto kniha je triler a určite nepatrí k oddychovému čítaniu. Ale odhliadnuc od toho nemôžem tvrdiť, že by sa mi kniha nepáčila alebo zle čítala. Iste, jednotlivé strany plynuli skutočne pomaly a mala som veľmi detailnú predstavu o tom, čo sa kde odohráva. Opäť sa tu prepletalo niekoľko zápletiek, ale až postupom toho pomalého vývoja som si uvedomila, že sú navzájom prepletené. Gradácia napätia bola skutočne majstrovská a keď prišlo vyvrcholenie, obzerala som sa cez plece, či niekde nezazriem iskričky ohňostroja. Také epické bolo. Řád věčných trnů nie je typickou fantasy a nie je možné úplne ju zaškatuľkovať. Má v sebe prvky niekoľkých žánrov, vďaka čomu je prístupnejšia oveľa širšiemu okruhu čitateľov. Takisto ju ozvláštňuje aj samotné prostredie a jeho vykreslenie. To dopĺňajú úryvky z východných mytológií, ich čarovné bytosti a takisto samotné princípy čarovania. Hoci sa to na prvý pohľad zdá nemožné, parížsko-vietnamská kombinácia dokáže veľmi dobre fungovať a Aliette de Bodard z tohto spojenia vyťažila naozaj maximum, nakoľko sa zamerala aj na tie kultúrne rozdiely. Síce ich vtesnala do sféry mágie a moci, ale je možné ich veľmi ľahko identifikovať. Čo takisto prispieva k budovaniu napätiu a gradácii celého deja. To zabezpečujú aj postavy a ich naozaj zložité charaktery, ktoré sa mi ani tentoraz nepodarilo úplne pochopiť. Na druhej strane ma vďaka tomu stále dokážu prekvapiť. Ani toto všetko však neprispelo k tomu, aby dej plynul o niečo rýchlejšie. Mal svoje vlastné ubíjajúce a niekedy naozaj pomalé tempo, v ktorom sa niektoré záležitosti pitvali naozaj až na poslednú kostičku v tele zápletky. Keď však prišlo ku kľúčovým okamihom, kniha mi opäť ukázala, aké je všetko prepojené a vlastne jednoduché, len ja som si to nedokázala pospájať. Čerešničkou na pomyselnej torte ostalo len prekvapivé epické vyvrcholenie, ktoré vo mne prebudilo túžbu po ďalších pokračovaniach tejto série. The House of Binding Thorns is the sequel to The House of Shattered Wings. I will fully admit I forgot most of the plot of the first book, even characters that I noted I liked I couldn't quite remember their actions. I think you could read this as a standalone, since I managed to make it through really only remembering Phillip's background. If you're interested in the world and characters, then you can go back and read book one. I read the first book about two years prior. I didn't realize it wa The House of Binding Thorns is the sequel to The House of Shattered Wings. I will fully admit I forgot most of the plot of the first book, even characters that I noted I liked I couldn't quite remember their actions. I read the first book about two years prior. I didn't realize it was that long of a time span. I don't know if I'm getting old, or if I read so many books that only the ones with really unique characters and plot stick in my mind over time. The House of Binding Thorns focuses on House Hawthorn. Madeleine, the angel essence user from the first book, is now back at Hawthorn. She's having trouble kicking her habit and she's fearful the head of the house, Asmodeus, is going to kill her. She's unfortunately bound with magic to the house, so there's no real escaping. Asmodeus allows her to go on a visit to the dragon kingdom with some other members of the house - Clothilde, the house human magician being a key character. Clothilde wants to know what happened to Ghislaine, a member of the house that went to visit the dragon queen, Ngoc Bich, as Ghislaine hasn't returned. Ngoc Bich and the rest of her court state Ghislaine left healthy and they have no idea what happened to her. A young dragon named Thuan is at House Hawthorn, pretending to be human, and he is trying to gather intelligence. He thinks House Hawthorn is weakening the dragon kingdom somehow. A houseless Fallen, Berith, and her partner Françoise live in poverty. Berith is slowly dying, and she wants Françoise and her soon to be born child to be safe. Berith has a connection to House Hawthorn that is revealed, and it gets the two of them somewhat caught up in the main events of the novel. Phillipe from the first book interacts mainly with Berith and Françoise. He keeps seeing ghosts of Isabella and Morningstar. There's some bad dragon people and some bad Fallen from another house. It's a mystery plot like the first one, with lots of brooding characters. There's not one character that actually knows everything that's going on, although Asmodeus is at the front of most of it. The ending felt like a hard sprint. So many characters all having showdowns. It was epic and bloody, but it was hard to have what seemed liked 50 pages of intense endings for the characters. There is less gore than the previous book. There's almost no angel harvesting, if you had an issue with that. The only mention is regarding a body in a morgue area that is being harvested, but other than that no kidnapping scenes. Plenty of people do get stabbed, however. The characters are moody and always brooding. It does make it hard to care for one character over the other, since they all have the same attitude, but at least their motivations were rather clear and I never forgot what one character was about. There's still many Vietnamese characters, and characters with varied sexual orientation. I am interested in de Bodard's work. I like the writing style and world-building, and I think in a few more books she is really going to come out with something spectacular. My biggest gripe with this one is that it just felt like too many characters for too short of a time. The House of Binding Thorns is the second entry in Aliette de Bodard’s invigoratingly different Dominion of the Fallen series. In a dystopian, post-WWI Paris Fallen angels have organised themselves into complex, political Houses; full of dependents who are magically linked to the leader of the House. A powerful clan of Vietnamese dragons lives under the Seine, besieged by illness and rebellion. Massed around these two linked societies, are the Houseless - a web of outsiders, and hungry gangs, wh The House of Binding Thorns is the second entry in Aliette de Bodard’s invigoratingly different Dominion of the Fallen series. In a dystopian, post-WWI Paris Fallen angels have organised themselves into complex, political Houses; full of dependents who are magically linked to the leader of the House. A powerful clan of Vietnamese dragons lives under the Seine, besieged by illness and rebellion. Massed around these two linked societies, are the Houseless - a web of outsiders, and hungry gangs, who have created their own separate, intricate communities. In this strong sequel to The House of Shattered Wings, de Bodard follows two familiar characters – Madeleine and Philippe – who have been thrown into unfamiliar surroundings, and also introduces a whole new cast of characters. Madeline, an older apothecary who is addicted to angel essence, now lives in House Hawthorn; dependent to Asmodeus a man she fears. Meanwhile, Philippe has broken his magical link to House Silverspires, and spends his time treating the Houseless while searching for a way to bring his best friend back from the dead. This new life brings him into contact with the Houseless angel Berith and her wife Francoise. Together with Thaun, a spy for the dragon court, all of these characters find themselves embroiled in a political battle even the highest of beings do not fully comprehend. Aliette de Bodard packs her world with a cast of people, and a set of relationships, that readers are unlikely to encounter, in such numbers, in much mainstream fantasy. And it’s not only the creation of an original magical world, and the diversity of the characters, which sets this series apart. It’s the way the world operates, the real-life underpinnings that de Board’s fantasy world is built on, and the way she puts life on the page when other writers would hide it behind a screen. De Bodard is as confident writing the bloody, every-day difficulty of birth as the fantastical pain of a character being skewered by a magical tree, and her skill at bringing emotional and physical reality to her fantasy world enriches her story. The House of Binding Thorns offers all this rich, wonderful world-building alongside a set of connected, thrilling plotlines. It really is a book that has it all. I am a speculative fiction author living in Paris, with a strong taste for history and mythology. Rice addict, tea addict and nước mắm addict. My short fiction has appeared in various professional venues, and my Aztec fantasy series "Obsidian and Blood", Servant of the Underworld, is published by Angry Robot. My next novel is The House of Shattered Wings, set in a devastated Paris where quasi-feud I am a speculative fiction author living in Paris, with a strong taste for history and mythology. Rice addict, tea addict and nước mắm addict. My next novel is The House of Shattered Wings, set in a devastated Paris where quasi-feudal Houses fight each other for dominance; and features fallen angels, dragons, immortals and witches--and entirely too many dead bodies. Forthcoming August 20th (Gollancz, UK/Commonwealth)/August 18th (Roc, US). In my spare time, I also double as a geek in maths and computer science.